Primarily designed to assist in improving the performance of samples used in FISH, Pisces Scientific offers a range of reagents suitable for improving the processing of FISH slides post hybridisation as well as the pretreatment of FFPE slides prior to FISH. Ready-to-use coverslip sealant for FISH assays. Stays supple without humidification; comes off cleanly in one piece. Eliminates scraping and picking off pieces of rubber cement that can break the coverslip causing damage to precious tissue samples requiring retests that consume expensive probes. CytoZyme Stabilized Pepsin is a liquid formulation of purified pepsin with enhanced shelf life used for preparing tissue samples for FISH assays. Provided as a concentrate ready for dilution in CytoZyme Reaction Buffer. A convenient 1M liquid formulation of NaSCN. 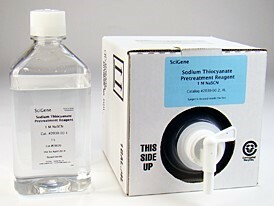 Use for pre-treating tissue samples prior to application of nucleic acid probes for cytogenetic assays, including FISH.